Microblading is all the rage right now. But sadly, so is Microblading eyebrow removal. With so many two day Microblading Tattoo classes promising to train people with no previous Permanent Makeup experience popping up everywhere, the volume of bad work coming to us for microblading removal has grown ten fold in the past year. We specialise in the removal of permanent makeup and perform hundreds of these procedures every month. 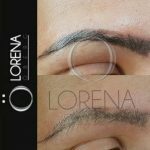 No one is more experienced and testament of this is that Lorena is invited to speak at Permanent Makeup Conferences all over the world about her removal techniques. 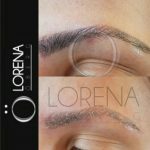 Often people are told that microblading is not a Tattoo. This is not true. Microbading is possibly one of the oldest forms of tattooing dating back 2000 years. If done correctly it sits in the epidermis and will fade in six months but if done deep, it will be a permanent tattoo and that’s where we can help. The good news is that compared to other forms of Permanent Makeup, Microbrading eyebrow removal is relatively easy compared to other forms of tattooing. Generally a couple of laser treatments is enough to fade the area by 60% +. We perform these treatments daily with a great deal of success. During your consultation we will walk you through all your options. 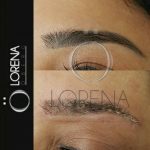 We will take you through all the Microblading Eyebrow Removal techniques available to you. You can make an appointment to see us by clicking the Book Now button here or on upper right hand of this site or you may call us on 01883 344273. We look forward to welcoming to discuss the best way forward for your removal process. Prices start at £250 per treatment with Vicki and £350 per treatment with Lorena.